Namobuddha Balthali Village Trek is an easy hiking/trekking destination located on the north east of Kathmandu city, a most scenic uncrowded place out of Kathmandu valley. Namo Buddha village and its hill station is very popular for Buddhism pilgrimage tour. Hike to Balthali village is a short walk allure for its natural environment, tiny villages with locals lifestyles and delightful landscapes. Balthali village to Namobuddha is lonely and enough good trek to explore Languor Monkeys along with. The most highlights of Balthali village is – the plateau with rice terraces and potato fields, glimpse of snowy mountains, green forests, rural hamlets, Buddhist monasteries and as well as Indreswor mahadev Temple of Panauiti. Drive to Khopasi town via Panauti (32-kilometer takes roughly 2 hours with Bus). The trip starts from Khopasi passing through Sanagaun, Nyaupane Gaun and hike down to Panauti, than Lakeshore Mahadev temple (one of the names of Lord Shiva) and follow the trail north along the river. Moreover you can rest at the flat ground and take snacks and enjoy the beautiful village. There are nice resorts in Balthali village, you can stop for overnight and return back to Kathmandu or hike up to Namo Buddha on next day. Namobuddha to Balthali hiking trip is possible at any time throughout the year.. This is a classical trek itinerary to discover the scenic Himalayan view and as well as to visit Buddhist and Hindu Pilgrimage destination. The particular is suitable for world travelers who wish to walk near Thamel Kathmandu within a more relaxed manner than take a look at this itinerary. Upon arrival in Kathmandu, Tribhuwan International Airport, we will receive you with private vehicle and transfer to hotel in Kathmandu within breakfast plan. Our representative will give you information about further programs. Day 02 World Heritage sites of Kathmandu Sightseeing. In the morning after breakfast, we start our day trip visiting world heritage sites located in Kathmandu city which includes Boudhanath stupa (also known as the oldest stupa of Nepal), Pasupatinath temple holy temple of Hindu where cremation takes place by the holy river Bagmati), Later we visit Kathmandu Durbar Square and Syambhunath Stupa. And transfer to hotel. 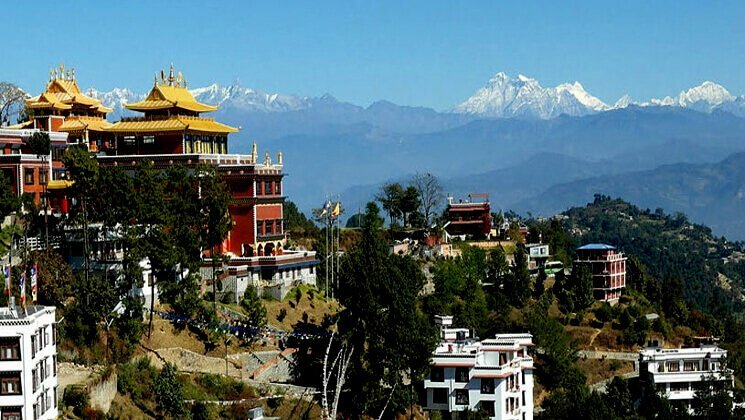 Drive to Dhulikhel and Hike to Namobuddha hill station. Hike to Namobuddha hill station offers fabulous panoramic views of the Jugal mountain range including Dorje Lhakpa. Furthermore, you can touch the fertile rice field and orange terraces to reach Namo Buddha hill. Namobuddha hill is historically important and it is a great Buddhist pilgrimage destination where you can visit a monastery. Stay overnight at Guesthouse. Sunrise view and again you will have touchy view of fertile farms and villages located on the way as we move ahead. During the trek you can walk over the part of the countryside to the east of Kathmandu is at its best, with streams and rivers, forests and farmlands, hills and plateaus — all spread out before you like the pictures in a painter’s canvass. In the evening, stay at Balthali Village and its resort. Day 05 Discover Balthali village ! Walk to Panuiti and Return. Today you will visit a typical Tamang village, Dada Gaun, where a Buddhist Community lives. It is very traditional and secluded from the modern world. Here people and animals live together side by side. We walk to Pada Gaun (2,100m), for good view of the whole Himalayan range to the north and beautiful green forest of Mahabharat. Moreover walk on to Karnali, a hamlet of nature, and follow the banks of the Ladku River back to the resort. We then walk to Panuiti town where you can see Hindu pilgrimage sites called Indreswor Mahadev Temple. After visiting around this temples and squares we return Kathmandu which takes about two hours. How much does Namobuddha Balthali Village Trek cost? Hike from Namobuddha to Balthali village trek route is available on USD 499 per person is in standard trek price on double occupancy basis. But of course, the trip price will vary according to group size. Private car transfer from Kathmandu to Dhulikhel and aslo from Panuiti to Kathmandu . Professional English speaking license holder trekking tour guide. We can organize private Namobuddha and Balthali village trek starting at any date that works for you. Please contact us for more information. Question: Do I need experience to do Namobuddha and Balthali village trek? Answer: No ! You do not need previous experience. Question: What kind of accommodation can I expect on Namobuddha and Balthali village trek? Question: What kind of food can I expect in Namobuddha Balthali Village Trek Tour? Answer: The lodges have attached restaurant and they cook a delicious range of mostly vegetarian such as Pasta, tuna bakes, noodles, potatoes, eggs, dhal bhat, bread, soups, fresh vegetables (variety depends on the season). Question: What opportunities will I have for a shower along this trekking? Answer: Guest house trekking all the lodges they have a hot and cold shower. Question: How do I get drinking water on Namobuddha and Balthali village Trekking? Answer: There are some shops where you can able to buy mineral water and you can buy for drinking . Answer: Yes, you can recharge your battery. Its not a problem. Question: Is there any communication facilities on Namobuddha Balthali Village Trek Tour? Answer: Yes ! during the route you can get telephone services as well as 3G internet facilities. Question: Who will carry my luggage on Namobuddha Balthali Village Trek? Answer: We provide porters to transfer your luggage on request (pay an extra cost) but as you are going just for 2 days hiking, you need just basic things. Answer: The distance you cover each day can vary greatly due to a gradient, terrain, and altitude. As such it is very hard to give specific distances on each day, however, you have to be prepared to walk roughly about 3 hours each day. Answer: Walking pools are not compulsory. Discover some of the Langtang Himalayan range from Namo Buddha and Balthali village. Walking through cultivated rice fields, mixed forest of Rhododendron, conifers trees. Best view of Dorje Lhakpa including some of the great mountains of Langtang range. Experience the mixed cultures, tradition and their life styles. Opportunities for challenging trekking or hiking and pleasant strolls are scattered all over this planet; you just need to know where to find them. We at Gokyo Treks and Expedition believe in the quality services. Your safety and satisfaction is our concern. We are a team of professional, experienced, well trained and licensed local guides who know the destination much better than others. Moreover, we give benefits to the local communities and helps to conserve natural resources which reduced in costs and consumption. Great landscapes and Highly recommended agency !. We have done 2 treks with Ammar and his crew. Our guide, Som, was fantastic and the porters happy and reliable. Ammar is great to deal with. We are coming again next year and will use Gokyo Treks and Expedition. Dr Robert Arthur Hilton, Melbourne, Australia.